Search Everything! Powered by WMS Discovery - Searching includes all the library resources that are available to you, including electronic databases. To renew items or place interlibrary loans, sign into your account. Access to these databases listed are authorized by IP Address. You will only be able to access these resources while on location at St. Patrick's. This list contains links and descriptions for all the electronic databases the library offers. PLEASE NOTE: We are open to the public during these posted hours. However, we are not a public library. Patrons seeking library resources and services outside of a theological/philosophical context should visit their closest public library. The Menlo Park Public Library is an excellent nearby resource. To reserve a course or submit a material request, please get in touch using this form. 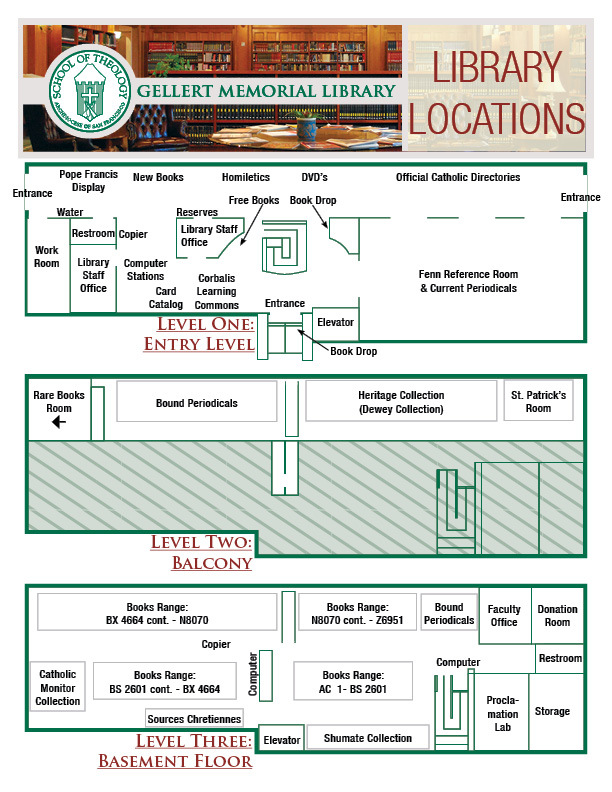 The Carl Gellert and Celia Berta Gellert Foundation Memorial Library (Gellert Library) is located on the first floor and basement of the C Wing (East). It houses approximately 150,000 bound volumes plus 5,000 volumes of bound periodicals. 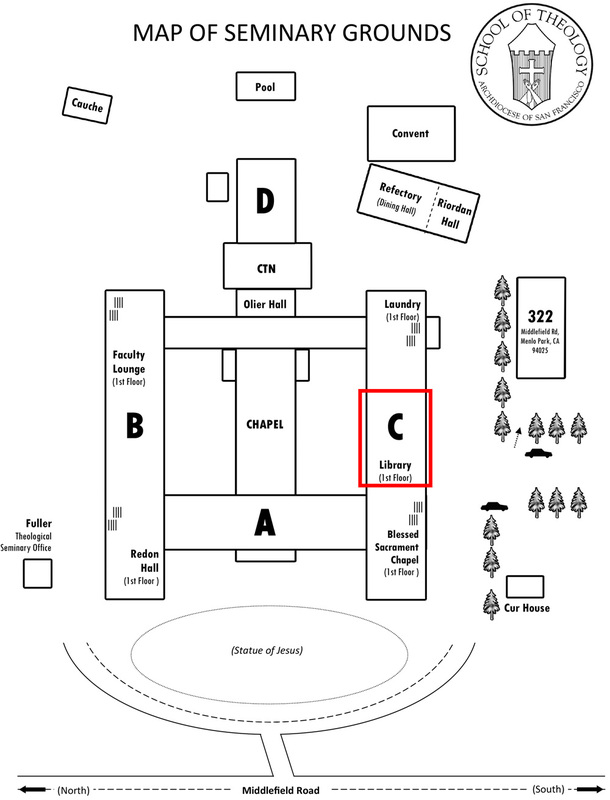 There is seating for 70 patrons at tables, carrels, and lounge chairs. There are eight desktop computer stations and wi-fi is available for laptop, tablet, and mobile device use throughout the facility. The Gellert Memorial Library is devoted to serving seminarians, faculty, staff, and the greater community by providing access to exceptional theological resources. The following policies and guidelines are implemented to ensure that our materials support academic research and scholarship. We are always open to new ideas and suggestions. Share your thoughts with us by phone: (650) 321-5655 or email: library@stpsu.edu. When classes are in session at either St. Patrick’s Seminary or Fuller Theological Seminary’s Northern California campus, the library is open 7 days of the week. At least one librarian is on duty during these hours except for the lunch hour, between 12:00 PM and 1:00 PM. Faculty and keyholding seminarians are permitted to use the library facilities outside of the above hours, but materials may only be borrowed during the posted hours. Current hours are posted on all library entrances, noticeboards for STPSU and Fuller, and the library’s website. One-time and permanent alterations to the operating hours will be communicated as far in advance as possible. Our collection is intended to be the extension of the communties we serve. Our scope is to acquire academically rigorous materials used for religious scholarship. While our emphasis is the Catholic Church and its teachings, our vision is also to provide information on a diverse range of social, religious, and political perspectives. Additionally, we acquire materials that support the ongoing academic and research interests of our faculty. As we progress into the information age, our collection will grow in tandem with the most current digital media formats. Finally, if you have a suggestion, we welcome you to share it with our library staff. The Gellert Memorial Library always welcomes donations. Contact the library first before bringing your donation: library@stpsu.edu or (650) 321-5655. Only materials pertinent to our collection development policy will be added to the collection. However, the materials not selected will be utilized within our community in a different capacity, or may be donated elsewhere. Faculty, Students and Staff- Current students, staff and faculty members are entitled to make use of all library materials. Alumni- Alumni of St. Patrick’s are also entitled to library privileges. Alumni may borrow books and are permitted to make use of the library's online databases in the library. However, the library's license agreements do not permit the use of online databases off-campus. Visitors- Visitors from local communities and parishes are welcome to use the library’s resources. If visitors would like to check out materials, they are required to fill out a Library Application Form. Library Catalog - The majority of our materials are cataloged and shelved according to the Library of Congress Classification system. The library owns approximately 120,000 volumes. Most of the materials can be checked out. When searching for books, it’s best to first consult our online catalog, then try our card catalog on site. In general, books older than 1992 will have records in our card catalog but most have been migrated to the online catalog. Books - The majority of collection is cataloged according to the Library of Congress Classification system. Most of the collection is located on the basement level of the library and underneath the mezzanine. Most of the volumes can be checked out, however reference books are limited to library use only. Dewey Decimal System - The library has a small collection of books organized by the dewey decimal system located on the mezzanine. Periodicals - The print periodical collection of the library is composed of the 120 periodicals currently received by the Library, as well as a substantial collection of titles which are no longer being published or are not currently being ordered. Religion and philosophy titles constitute the majority of the collection, but periodicals dealing with other areas of the curriculum may also be found. Current periodicals are displayed on the display racks, with back issues and bound volumes shelved in the periodical stacks in alphabetical order. Most of the library’s periodicals are indexed by either the ATLA Religion Database or the Catholic Periodical Literature Index. Additionally, the online databases may either link to or directly provide access to an additional number of electronic journals, many of which are not available from the library’s print collection. Periodicals are for library use only, and do not circulate outside of the library, though photocopies may be made for personal use in compliance with current copyright law. Reference Materials - Reference books are located in the Fenn Reference Room. These materials are library use only. Reference materials in our collection include, dictionaries (english and others), encyclopedias, maps, indexes, atlases, biographies, and bibliographies. Generally, reference materials are very useful for gathering general information on a subject. However, theology reference books available will range from general information on religions (i.e. The New Schaff-Herzog Encyclopedia of Religious Knowledge and the Encyclopedia of Religion), to more specialized information on a specific type of religion (i.e. Encyclopedia of Catholic Social thought,Social science, Social Policy and The Thomas Aquinatis Opera omnia). Audiovisual Materials - The library owns approximately 325 DVD’s and 100 CD’s. All titles are searchable via the online catalog and may be borrowed for the same length of time as books. Audiovisual materials are shelved on the first floor in acquisition order. Cameras and video accessories (e.g. tripods, projectors) are also available for checkout and should be requested through a member of the library staff. Databases - Access electronic Databases through our online catalog. Available Databases: ATLA Religion Database with ATLASerials, EBSCO Religion & Philosophy Collection, ProQuest Religion and Gale/Infotrac Religion & Philosophy, JSTOR: Arts & Sciences XIII and Religion & Theology, The Catholic Periodical Literature Index, Philosopher’s Index, Old Testament Abstracts, and New Testament Abstracts. Checking Materials Out - Materials may be renewed for an additional borrowing period (effective from the date of the renewal request) unless the item has been requested by another patron. To ensure borrowed materials are properly returned to the library collection upon completion of use, they must be returned via book drop, either through the indoor slot by the circulation desk or the outdoor box located by the library’s main entrance. Any book in circulation may be recalled immediately for course reserve or for an individual after the designated borrowing period has elapsed. A borrower may request that a "hold" be put on an item checked out to another patron. Additionally, patrons may request materials currently on the shelf (not checked out) to be collected by the library staff and held for pickup within one week of the request. The patron is responsible for all books and other material checked out of the library and will be expected to replace or provide financially or in-kind for the replacement of any lost, misplaced, or damaged items. interlibrary loans (see section below). Course Reserves- Books and other materials required for seminary courses may be placed on reserve by Faculty members. Since these titles are in demand for intensive use by many students, the materials are restricted to library use only. Course reserve books may only circulate with the express permission of the course instructor and library staff and should be returned directly to a librarian upon completion of use. Interlibrary Loan Services - are available to all library patrons. If the library does not have a needed item, an interlibrary loan request should through the ILL request form. Current editions of textbooks, newly-released titles and video/multimedia are typically not loaned from other libraries and should not be requested via interlibrary loan. Interlibrary loan items are checked out upon receipt by the library and the due date is established by the lending library. The patron must see that the item is returned to the Gellert Library (NOT the lending library) by the due date. Delinquent borrowers may be asked to pay fines assessed by the lending library. Requesting Library-Use-Only Materials - Periodical and reference resource (e.g. encyclopedia, dictionary) articles may be requested in the form of photocopies, rather than a physical loan, as these materials typically do not circulate from libraries. Photocopied material does not need to be returned to the library. Multifunction machines on each floor of the library are available for the printing, copying and scanning needs of the seminary community. Printing and copying cost 5 cents per page. Scanning a file to e-mail is free of charge. The librarians and seminarian support staff are available to help patrons using the machines. The table in front of the library director’s office holds books that are free to the seminary community due to duplication in the existing collection or because the materials are outside the scope of the library’s collection. They do not need to be checked out.